NOIDA/GHAZIABAD: The transport authorities have their task cut out for them in Noida and Ghaziabad in the wake of the Supreme Court’s order on Monday, prohibiting the plying of 15-year-old petrol and 10-year-old diesel vehicles in the National Capital Region (NCR). 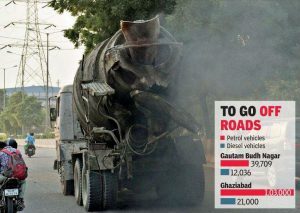 Currently, a total of 1.81 lakh such ‘polluting’ vehicles are registered in Noida and Ghaziabad. The authorities said they would comply with the apex court’s directive that requires transport departments to impound old vehicles if found plying in Delhi-NCR. Moreover, the three-judge bench, while reiterating the NGT’s earlier orders, also asked authorities concerned to prepare lists of such old vehicles and publish them on the websites of Central Pollution Control Board (CPCB) and the transport departments of NCR. Available data suggests 1,29,825 old vehicles, including both petrol and diesel-run, are currently plying in Ghaziabad alone, while there are 51,745 such vehicles in Gautam Budh Nagar. Of the 1.29 lakh vehicles, 1,11,730 petrol-run vehicles are older than 15 years and 18,095 diesel-run vehicles are aged over 10 years in Ghaziabad district. Similarly, in Gautam Budh Nagar, the number of vehicles that should go off roads is 39,709 (petrol) and 12,036 (diesel), respectively. The National Green Tribunal (NGT) had prohibited diesel vehicles older than 10 years and petrol vehicles older than 15 years from plying in Delhi-NCR in April 2015, and then again in July 2016. That such a whopping number of old vehicles are still found on roads underlines the failure of the authorities in implementing the green tribunal’s earlier orders in letter and spirit. Further, sources revealed, the transport departments had started issuing no-objection certificates (NOCs) to owners of old vehicles soon after the NGT orders, allowing them to use their vehicles in other districts of Uttar Pradesh. But, the figures suggest that not many had opted for the exit route. For example, in Gautam Budh Nagar, owners of only 1,710 old petrol and 2,615 diesel vehicles had taken NOCs for plying outside the NCR. Gautam Budh Nagar ARTO (administration) Arunendra Pandey said the enforcement section was given the task to impound vehicles violating the NGT orders. Till date, only 2,000 such vehicles had been impounded by the authorities in Gautam Budh Nagar. Gautam Budh Nagar district magistrate BN Singh told TOI that the administration would work out a strategy for strict execution of the SC order. However, as TOI had reported earlier, too, the transport officials are confused as what to do with impounded vehicles, for there is no provision in the Motor Vehicles Act to destroy a seized vehicle. Ghaziabad RTO Ajay Tripathi, on the other hand, said while owners of many such vehicles had been seeking NOCs to move out of the NCR after the NGT orders, they would study the Supreme Court directives properly to see how they could be implementation in the district.